How did we become so multicultural? Today Canada is one of the most multicultural countries in the world, and the home of immigrants of every ethnic and religious group from every country in the world. But less than 500 years ago, the only people living in Canada were the Aboriginal people "Aboriginal" means the original inhabitants, the people who were here first. Today, we refer to them as First Nations. However, there are many different cultural groups (discussed in a few days). 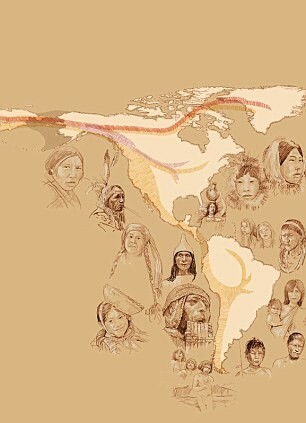 All of these groups originally crossed a land bridge "Beringia" that connected Asia (Siberia) and North America between 15,000 to 10,000 years ago. 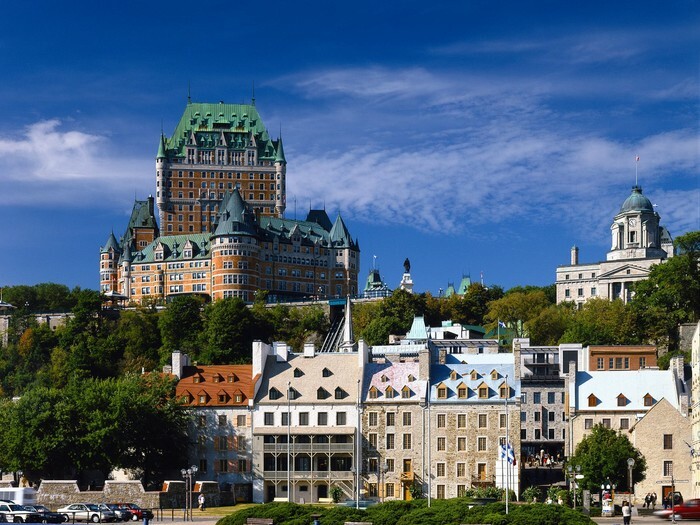 While France was quickly able to establish a new colony called New France along the St. Lawrence River - a colony mainly fueled by farming and the trading of furs with the Aboriginals - the settlement of this region wasn't always peaceful. It came with costly wars and conflicts, first with the Aboriginals, later the British. In 1608, Samuel de Champlain created the first truly permanent French settlement in the area around where Québec City stands today. Canada was governed from 1774 to 1791 under the terms of the Quebec Act. As the number of British settlers increased, however, it became clear to Britain that this act was no longer adequate. British institutions needed to be transplanted to British North America. This was accomplished by the Constitutional Act of 1791. 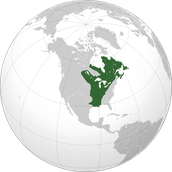 The Constitutional Act divided the colony into the provinces of Upper Canada (now southern Ontario) and Lower Canada (now southern Quebec). 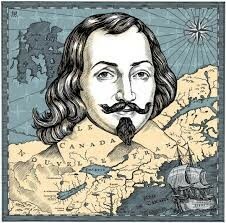 The Dominion of Canada wasn't born out of revolution, or a sweeping outburst of nationalism. Rather, it was created in a series of conferences and orderly negotiations, culminating in the terms of Confederation on 1 July 1867. 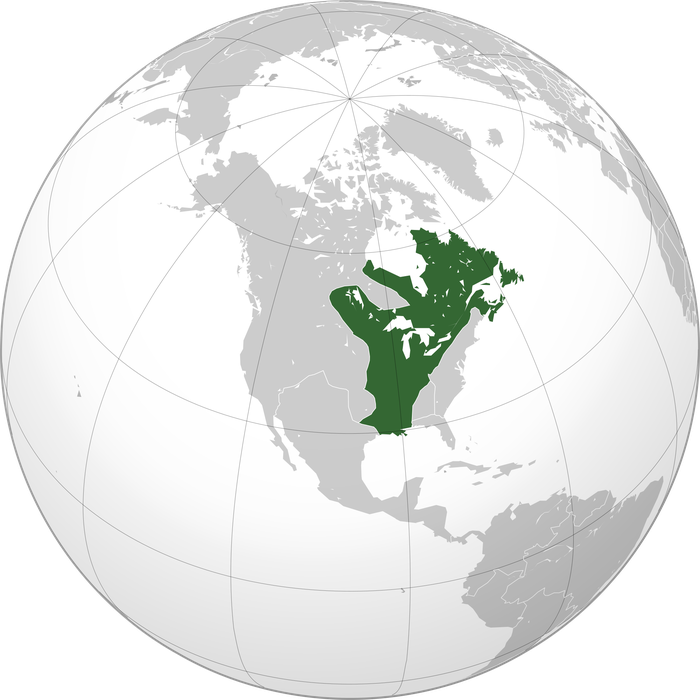 The union of the British North American colonies of New Brunswick, Nova Scotia, and the Province of Canada was the first step in a slow but steady nation-building exercise that would come to encompass other territories, and eventually fulfill the dream of a country a mari usque ad mare [from sea to sea]. criminals and destitute people from coming to Canada. from moving into the Canadian prairies and annexing the land to the United States. Canadian Prairies in many languages and distributes them across the United States and Europe. 1914 - The Komagata Maru incident involved a Japanese steamship, the Komagata Maru, that sailed from Japan to Vancouver, BC carrying 376 passengers from Pujab, India. Of them 24 were admitted to Canada, but the 352 other passengers were not allowed to land in Canada, and the ship was forced to return to India. 340 of the passengers were Sikhs. 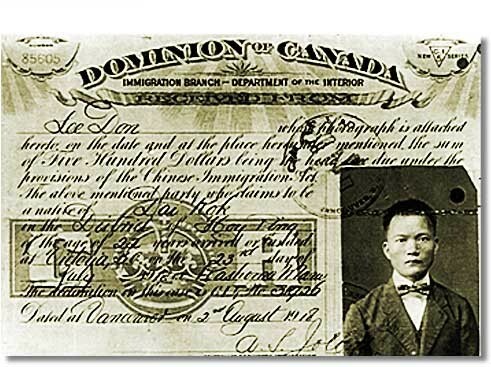 This was one of several incidents involving exclusion laws in both Canada and the US designed to keep out immigrants of only Asian origin. 1918 – Europe has been badly affected by the WWI (1914-1918), and many people are looking to emigrate. Canada does not want these immigrants. Anti-foreigner sentiment is high after the war. 1930 – The Great Depression begins, and Canada falls into an economic slump. A law is passed forbidding immigration to anyone except for people with enough money to establish and maintain themselves on a farm. 1967 – The Points System is created. Because the right to immigrate is no longer based on race or ethnicity, a new system is needed that is not based on racial criteria. 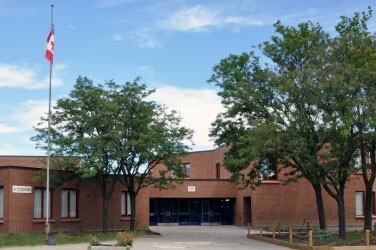 Potential immigrants are assigned points in a number of categories, including education, age, personal characteristics, fluency in French or English, and job opportunities in Canada. If they receive more than fifty points, they are accepted into Canada. 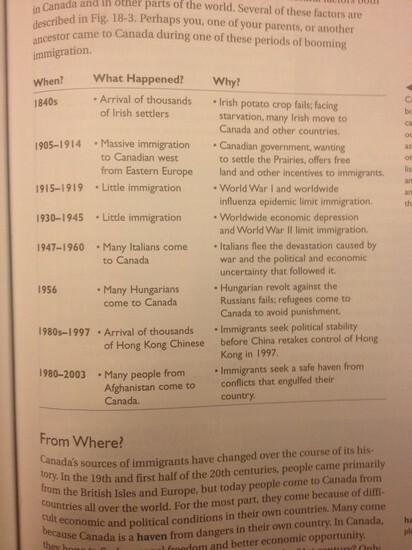 Work with your table group to find out more about the history of Canadian immigration as you match each push factor (reason for leaving a place) and pull factor (reason for choosing a place) with the correct time period. For each time period, write the number that corresponds with each push or pull factor as appropriate. To help you, read the clues for each time period.